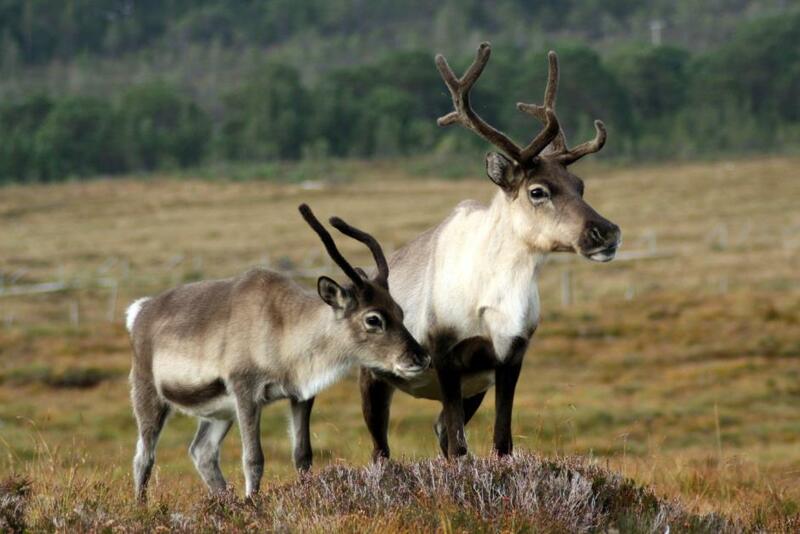 An incredibly important part of the life of a Cairngorm reindeer is its time free-ranging. 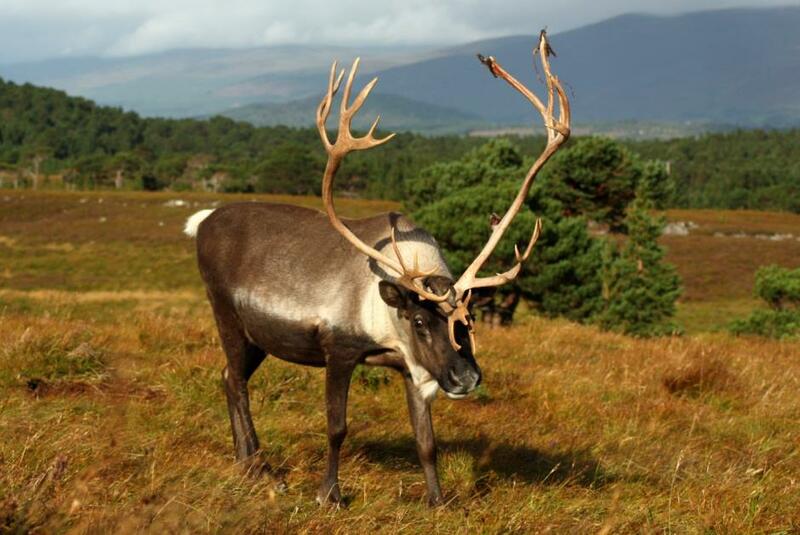 For the male reindeer their time to free-range is the cold winter months, where they happily roam the Cromdale hills keeping out of mischief. 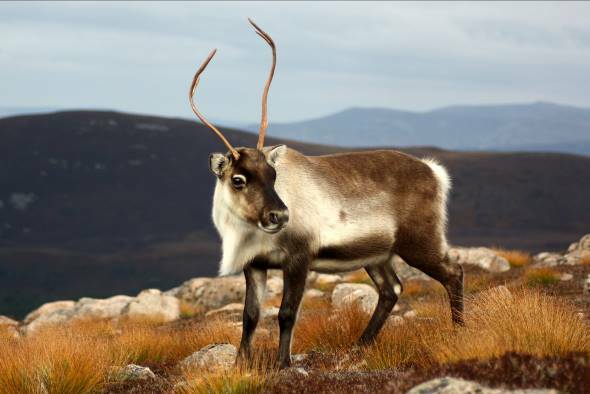 The life of a female Cairngorm reindeer is even wilder, with almost the entire year spent free-ranging the mountains apart from time in the enclosure during calving and rutting. 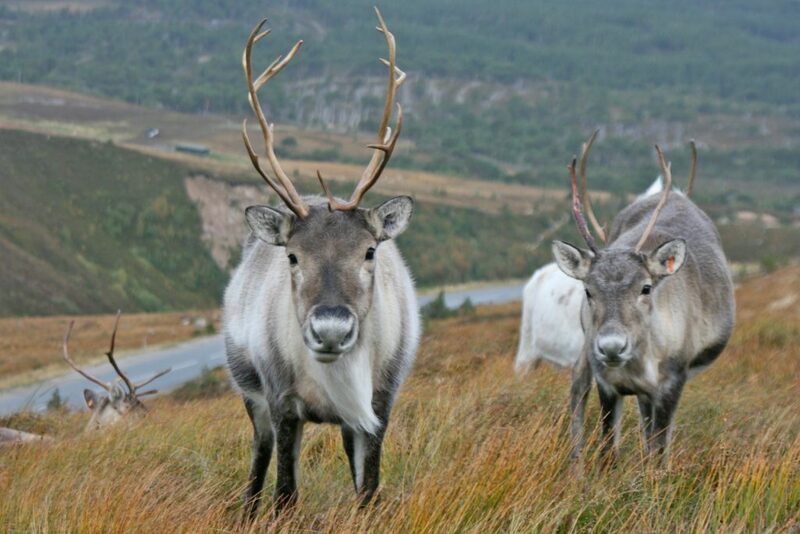 When the reindeer are free-ranging there are no fences holding them in, and they are able to walk anywhere they chose however they are only meant to be on some of the land. If they venture off our land in search of a tasty bit of lichen we move them back to where they are meant to be. 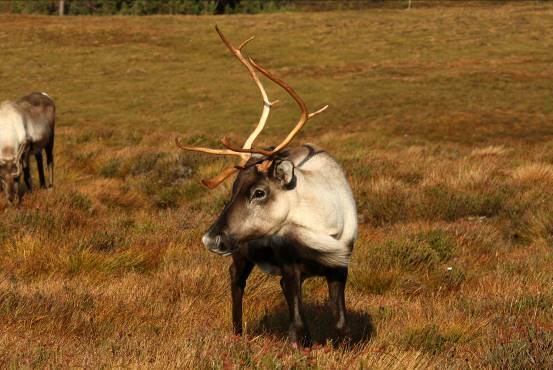 This often involves a day walking in the mountains looking for reindeer and sometimes moving them to a better location. 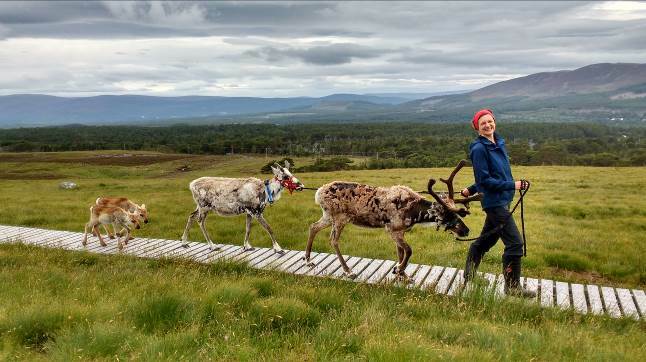 There are a number of ways to move a herd of reindeer. For those of you who have been on our hill trips you will know how keenly they follow a bag of food; however they will only follow food so far. 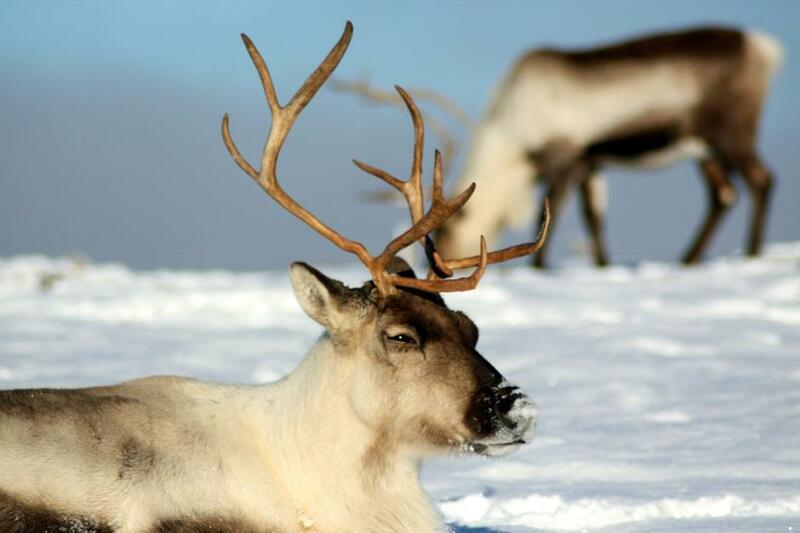 Another good technique is to lead a few of the reindeer on halters and hope that the rest of the herd follow. 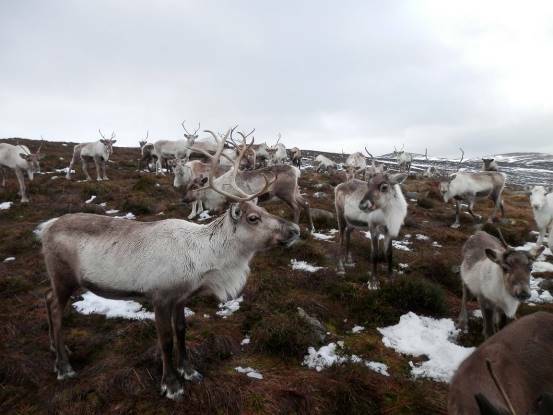 A week or so ago Fiona came across a group of naughty females reindeer just off our land, she was unable to move the group on her own so we waited for a day clear enough to move them. On a clear day last week sometime (well mostly clear above the mountains at least) Fi, Tilly, Chris and I headed up to move a group of the free-ranging females from the tops of the northern corries further down the mountains. 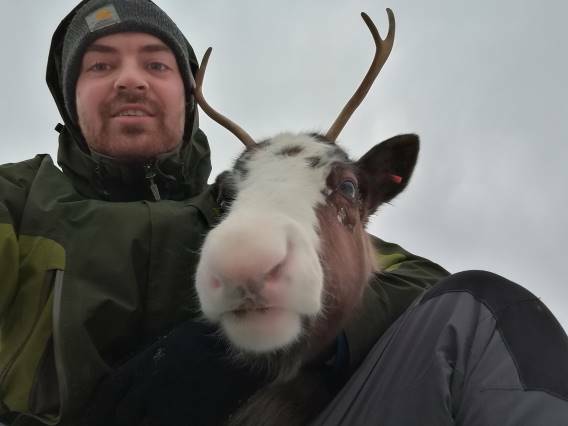 We headed up in pairs up two separate ridges to maximise ground coverage with the plan to join together when we found reindeer. 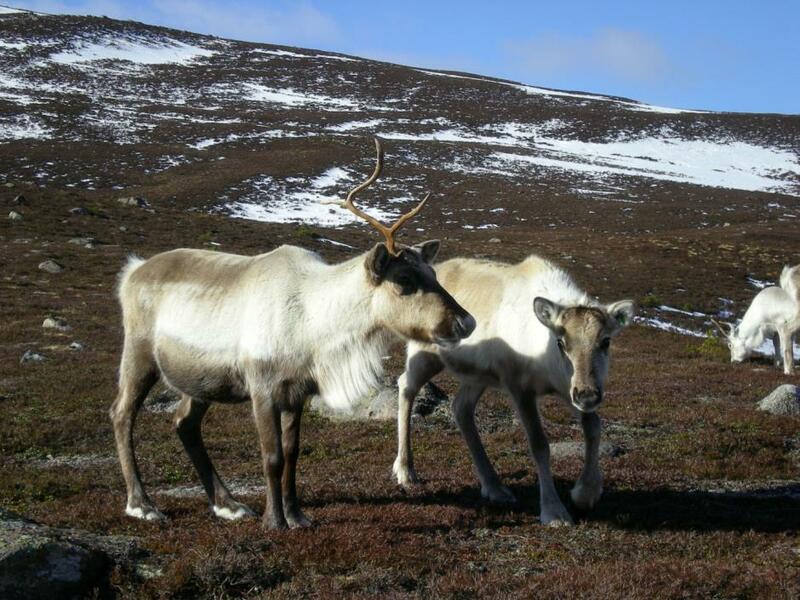 Chris and Tilly headed up Cairn Gorm and soon spotted the group of reindeer. So Fi and I headed towards them with Chris catching us up on route. We reached the group of reindeer just in time as the clouds covered us. We decided the distance we wanted to move them was too large to persuade them with a bag of food so instead decided to halter a few of them. 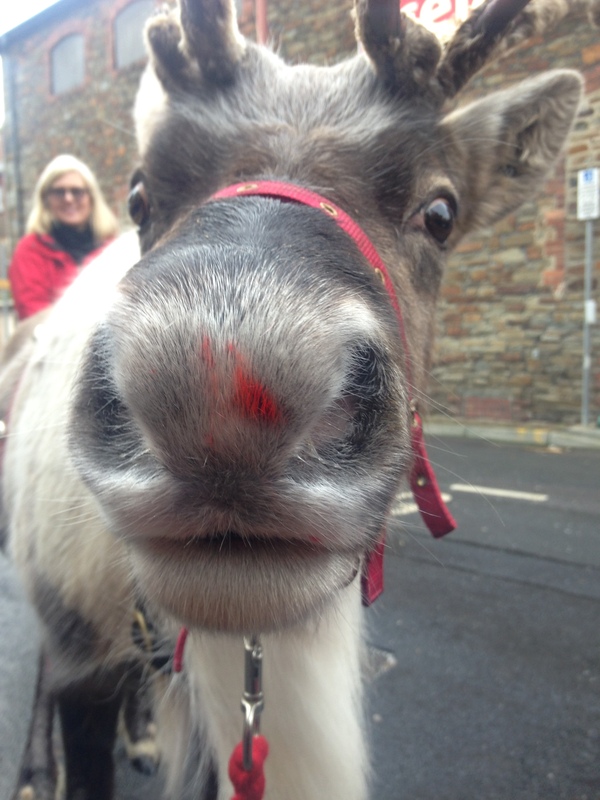 Having caught the ten most willing reindeer we headed down to meet Tilly who was coming up from below. 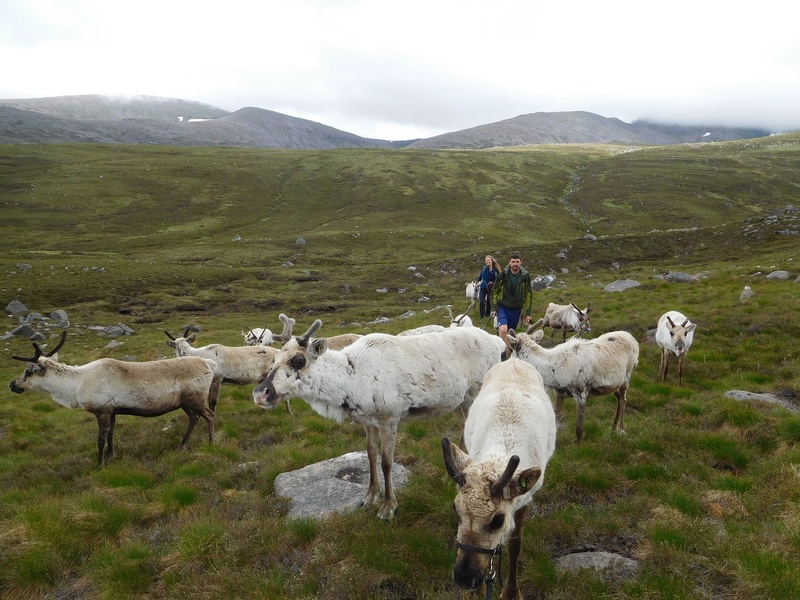 We then walked with the reindeer for about an hour till we found the right spot to leave them with a bit of food each in the hope that they will now stay in that area. Tilly went out walking a few days later and didn’t see any reindeer where they weren’t meant to be so it seems our mission was a success. 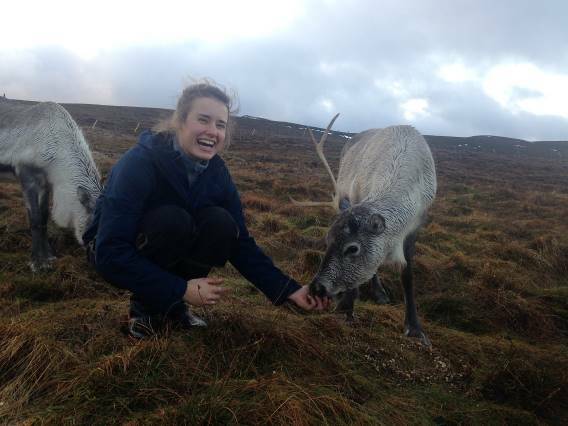 Spending a day in the hills is always one of my favourite things to do, but when it involves interacting with the reindeer in their environment it really is a pretty special experience. 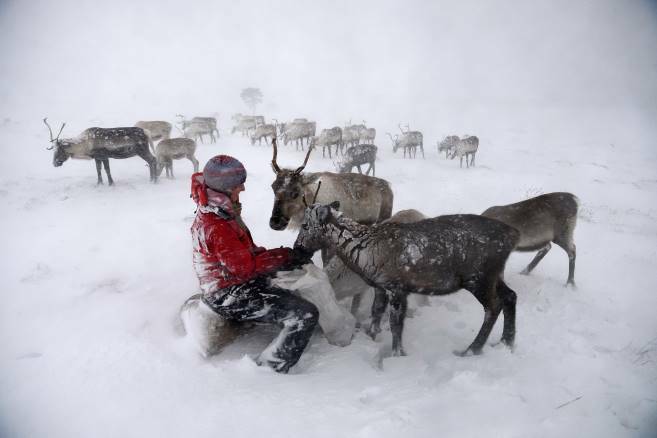 A day like this has got to be one of the highlights of being a reindeer herder. Chris looking grumpy after Gazelle and Merida were being pests on the headcollars. 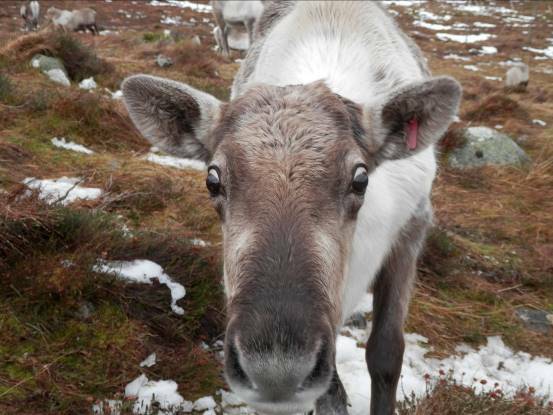 Also because Tilly was leading Inca, one of his favourite reindeer. How do we get across these boulders? 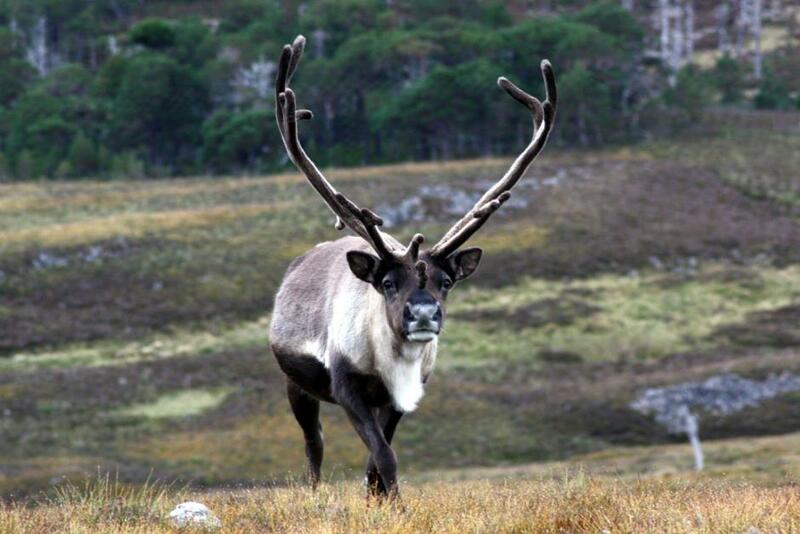 After 66 years of reindeer herding in Scotland we have had a first. 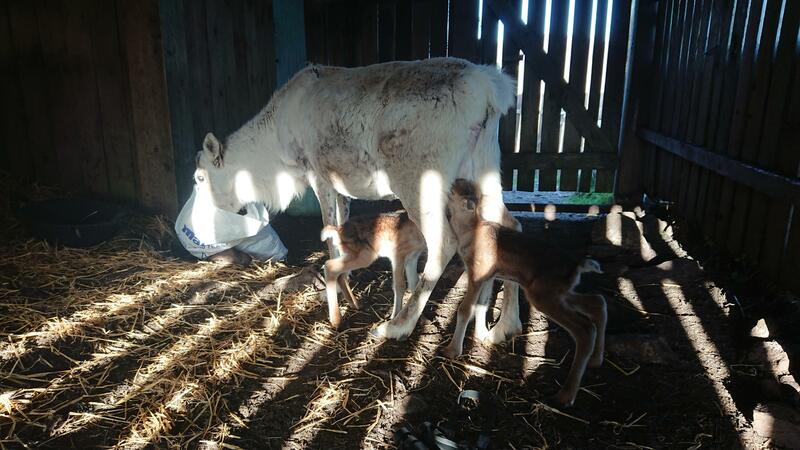 On the 8th May 2018 we had live twins born! 30 years ago we had twins, one was stillborn and the other survived for 12 hours. Since then we have had two sets (2008 and 2015) but both were stillborn so you can imagine our shock when we found them both alive and well. Their mother Lulu is one of our older females in the herd, at 12 years, and she is taking everything in her stride and not batting an eyelid at the two little bundles following her. 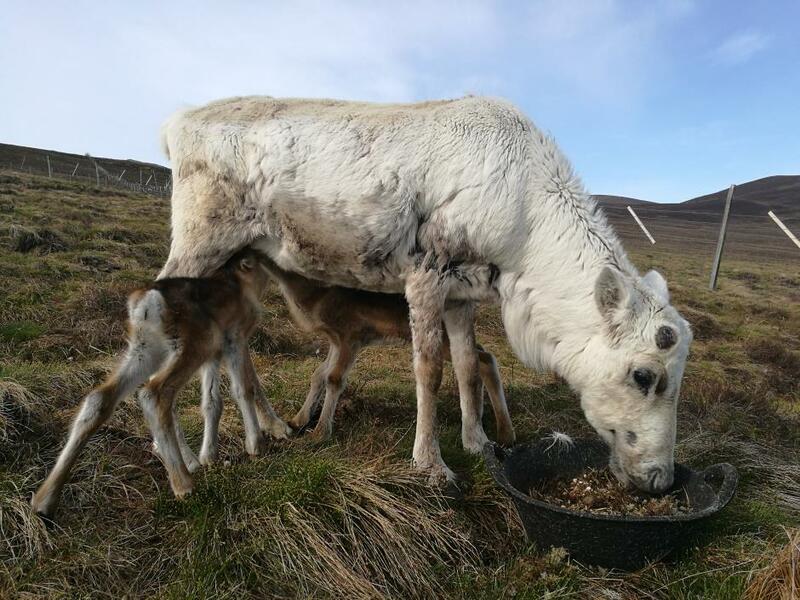 She loves them both and lets them feed, however we are giving her a helping hand by offering them a top-up of bottled milk as we feel she hasn’t got enough to sustain two. 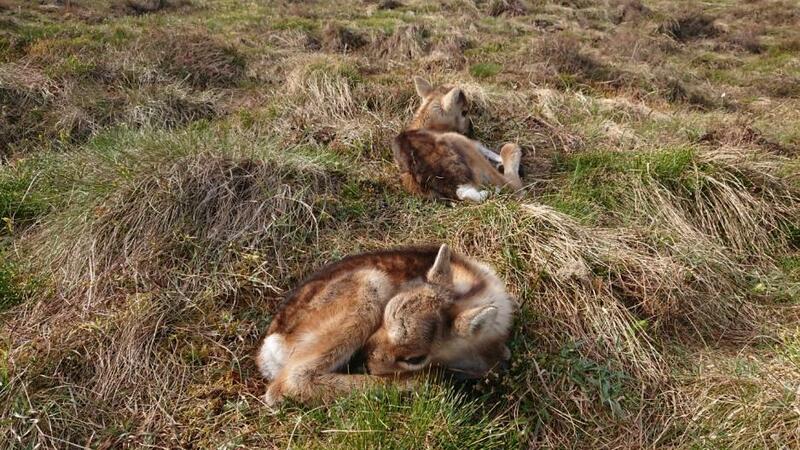 They spent their first two weeks up in our mountain enclosure where they were born and we have been going out first thing in the morning and last thing at night every day since to make sure they were getting enough milk. They were being supported to suckle from Lulu in their first few days but now they are growing well and coming on leaps and bounds, and feeding themselves. We of course must remain realistic as this is extremely rare with only one other known case of twins being born in the world: in Finland in 2010. We will do our best by both them and Lulu, making sure she gets extra feed, browse and attention. 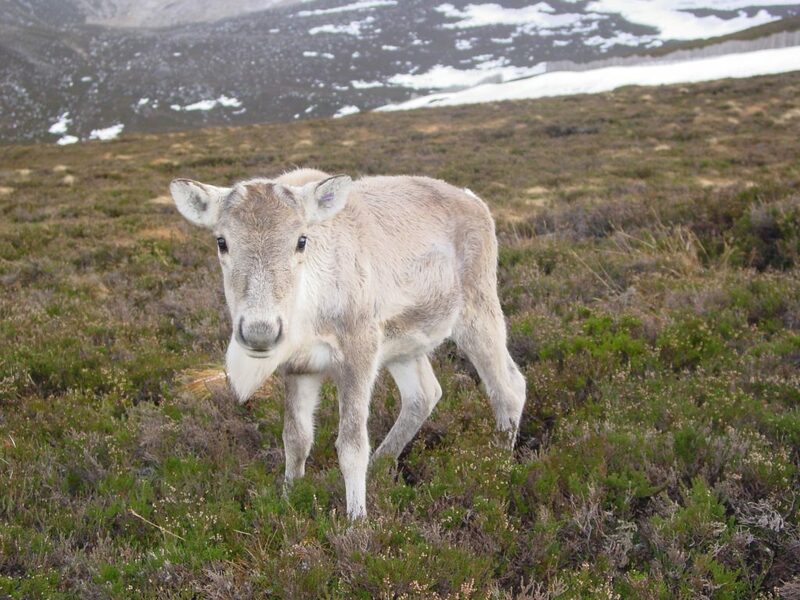 Summer time is crucial for keeping an eye on reindeer with biting insects causing illnesses which the twins will be more susceptible to so their first six months are going to be a rocky road, however we feel they have rallied through their first two weeks so this amazing news can go public. One of the first photos featuring Lulu and her twins. We gave Lulu and the twins the shed for the first few nights to help the boys save a little bit of extra energy for growing! 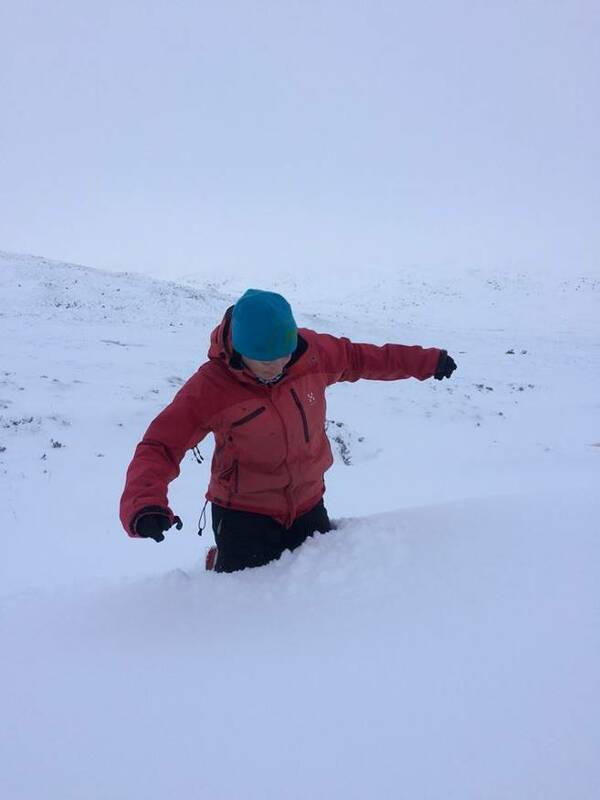 Visitors to the Cairngorms often have a hard time understanding just how unpredictable and harsh the weather can be here, particularly in the months of December to March, but often encompassing November and April too. 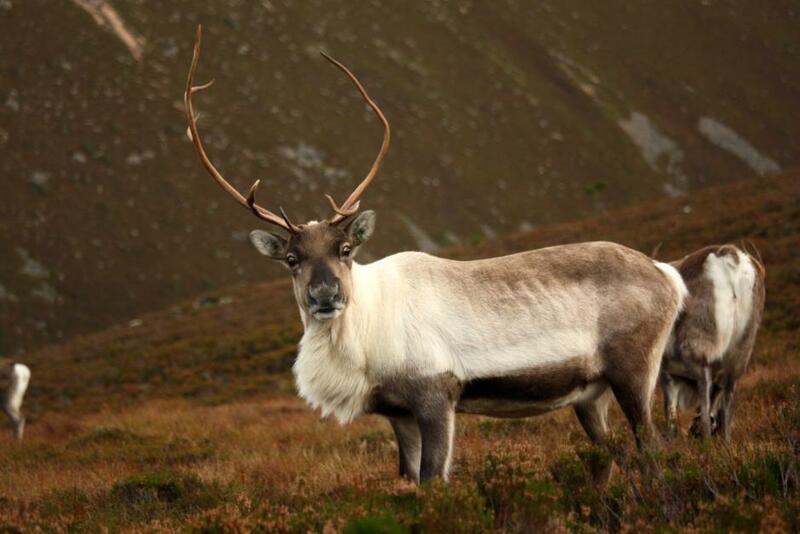 The Cairngorms are the only area of the UK with a sub-arctic habitat, and our weather here is a whole different kettle of fish to the rest of the country. 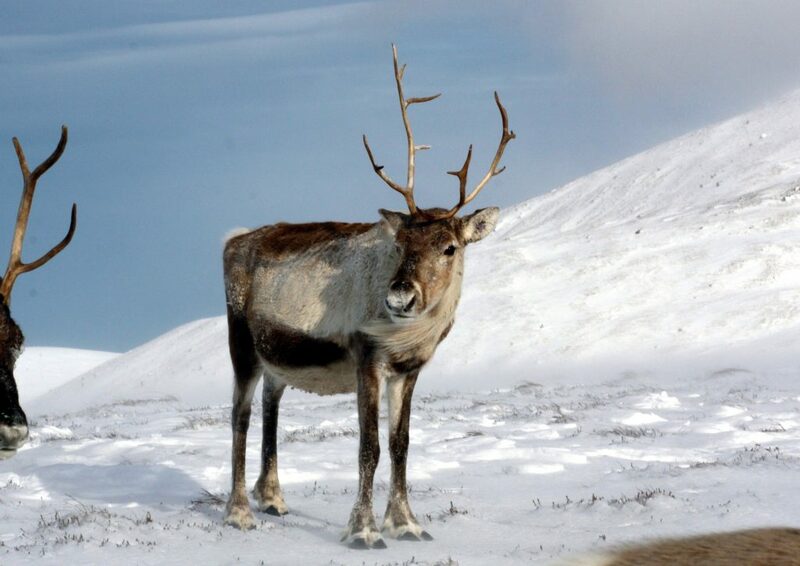 No problem for the reindeer who have evolved to live in such a hostile climate, but the reindeer herders certainly feel the effects of such long winter seasons. Just now it’s mid-March, and while much of the country is thinking about spring, we are still held firmly in the grips of winter. 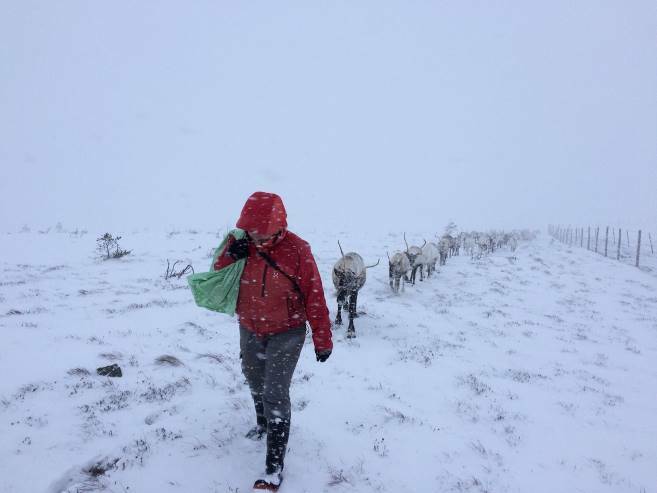 It’s very cold outside and snowing lightly, but to be honest the weather down here in the glen is fairly benign compared to that which the reindeer are currently dealing with up on the hills. A glance at the Mountain Weather Information Service (http://www.mwis.org.uk) shows the current temperature at -8°C but with the windchill dropping that to -23°C. The highest windspeed on top of Cairngorm itself in the last 24 hours was 99mph, but it hit 127mph two days ago. You can find some good videos on our Facebook page each winter (click on ‘Videos’ on the left hand side of the page) of the wild weather, though videos still don’t capture quite how it actually feels. 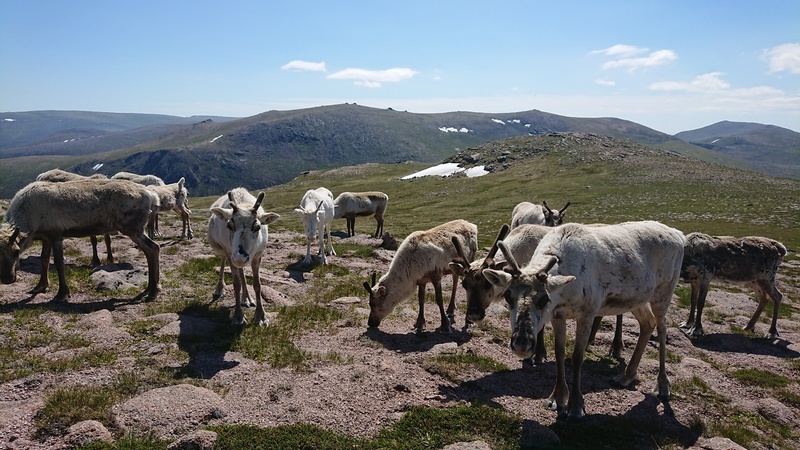 While we’re closed to the public in January, from February through till the end of April we run our 11am Hill Trip out to the free-ranging reindeer on the mountains daily, as long as we can locate the herd, but also only if the weather is ok. And it can be a big ‘if’. If you’ve visited us at this time of year before you might know the scenario first-hand – you’ve driven a couple of hours to get here, the weather seems ok, you’ve brought your warm clothes, the roads are fine…only to find an apologetic and slightly fraught reindeer herder here in the shop doing their best to explain to everyone that there will be no Hill Trip until tomorrow. Or possibly tomorrow. Maybe not. Ask us in the morning. From our point of view it can be very difficult to describe to people just how different the conditions will be above the treeline, away from the shelter and safety of the glen – over the years I’ve had many an angry parent trying to convince me that their two year old would be fine, when I know full well that the parent themselves would barely be able to stand upright, let alone their toddler. It can be extremely hard to turn people away. Sometimes our last line of persuasion is to tell them to drive up to one of the ski carparks first where the weather will be more like it will on the Hill Trip, and then to come back if they’d still like to book on. Invariably, they never do. But if we can, we will always run the Hill Trip, although sometimes only with adults, or even only with adults if they are wearing ski gear – jeans don’t keep anyone warm and are useless in winter. We don’t want to turn people away if we can help it though, so over the years I’ve led trips in howling gales, sideways blizzards, zero visibility, and in extremely slippery conditions where the whole group has crept around like Bambi on ice. There was a memorable trip in -10°C one year. 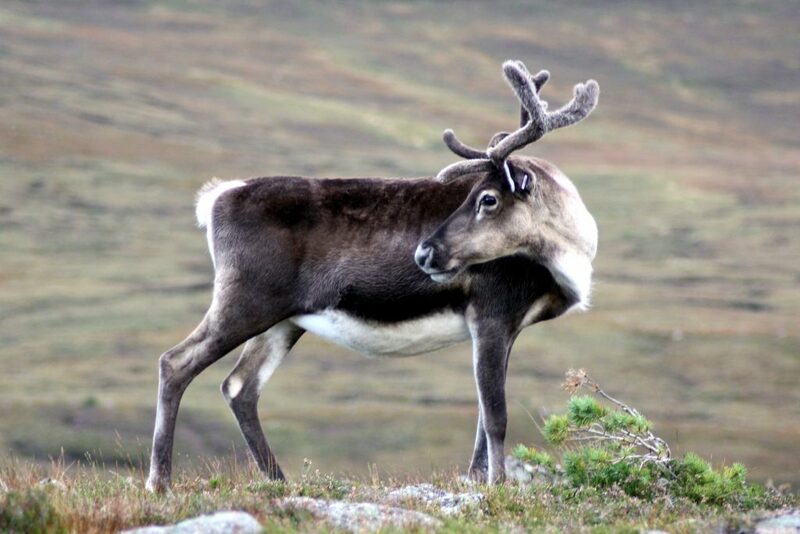 In general visitors can be very game when there is the prospect of a herd of reindeer to see, but I often wonder in years to come, whether it will be the reindeer they remember or the weather conditions. Sometimes I’m just not tall enough for this job! 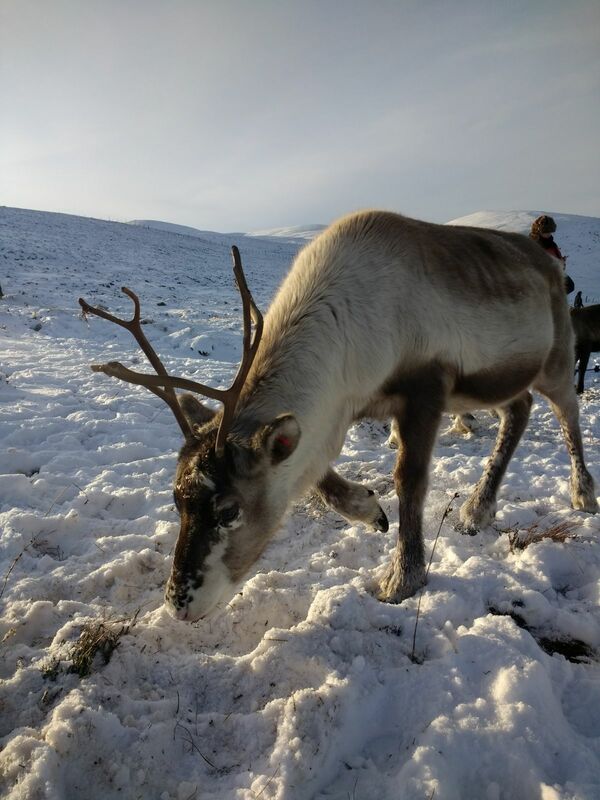 So apparently a 2 day stint of volunteering at The Cairngorm Reindeer Centre earns someone the dubious honour of writing a blog!! 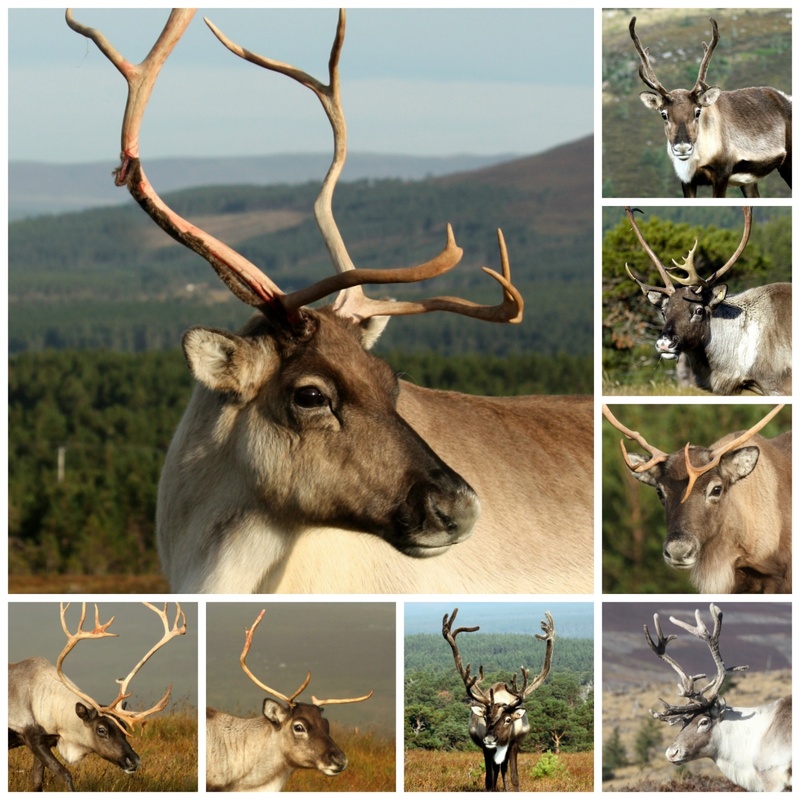 We have been visiting the reindeer for 14 years or so now. On our first visit we fell in love with a gorgeous calf called Java, immediately sponsored him and the rest as they say is history! 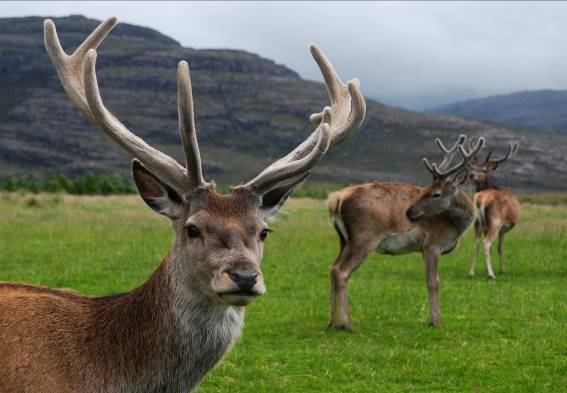 We currently adopt Sambar and Orkney for ourselves and a further 3 reindeer for family members at Christmas, Scrabble, Jaffa and Gazelle. 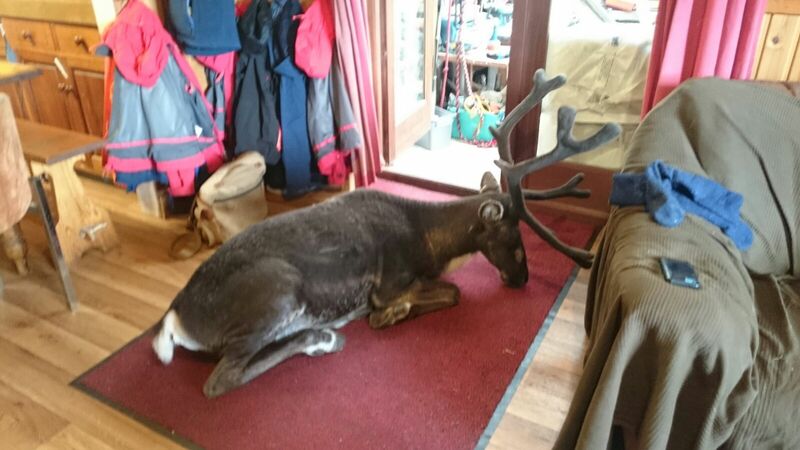 I have been up to reindeer house previously to volunteer, allegedly to help out, but probably cause as much of a hindrance! But I have never been in the snow, so when the opportunity came up this year I jumped at the chance. Although I was away for 4 days, I was only able to be at the centre for 2 days as coming up from Leeds I needed a day travelling at either end. 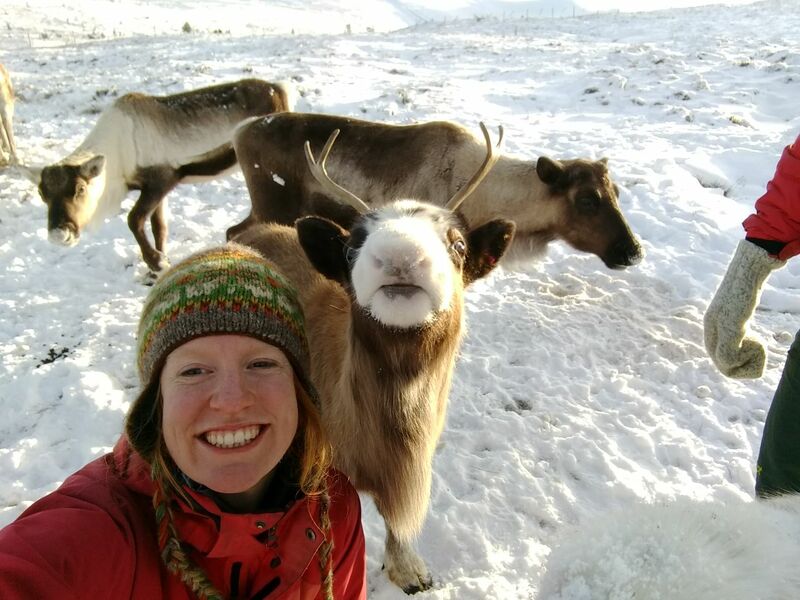 I arrived at 9am, as instructed, on a gorgeous, cold Tuesday morning to be met by the lovely Chris, Andi and Olly, who were only too keen to introduce me to the delights of being a volunteer reindeer herder. Apparently the most important job, and I really have no issue with this, is making tea! This however can only be done after clearing up the reindeer poo from the paddock area, followed by a quick guide of where all the necessary switches for the fab information displays are, oh and checking the videos are on, stationary filled up, water heater switched on and a general tidy up, and I thought I was kind of on holiday!! Thankfully there was an ‘idiots guide’ for all this, as the next day I ended up doing it on my own! 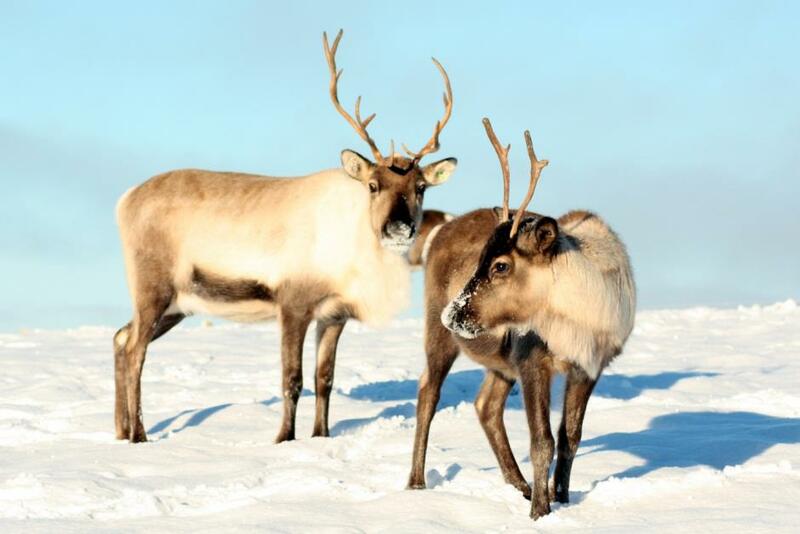 Including bringing the reindeer out of the woods at the side of the paddock into the display area, thankfully, as any of you who have visited the herd will know, all you really have to do is show them some food and they will follow you anywhere! Jaffa, born 2009. 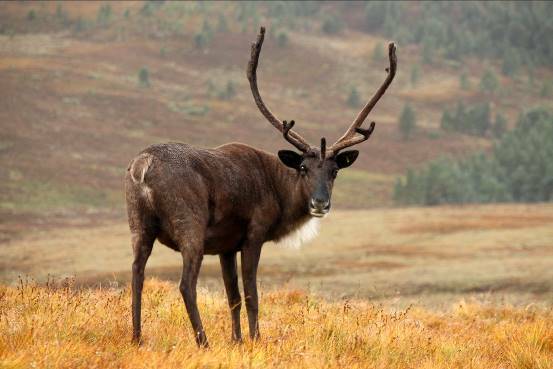 One of the darker reindeer in the herd. She’s also another greedy reindeer! All that done and tea made and drunk, I was lucky enough to go on the hill visit with Chris and Olly, leaving Andi holding the fort at reindeer house. 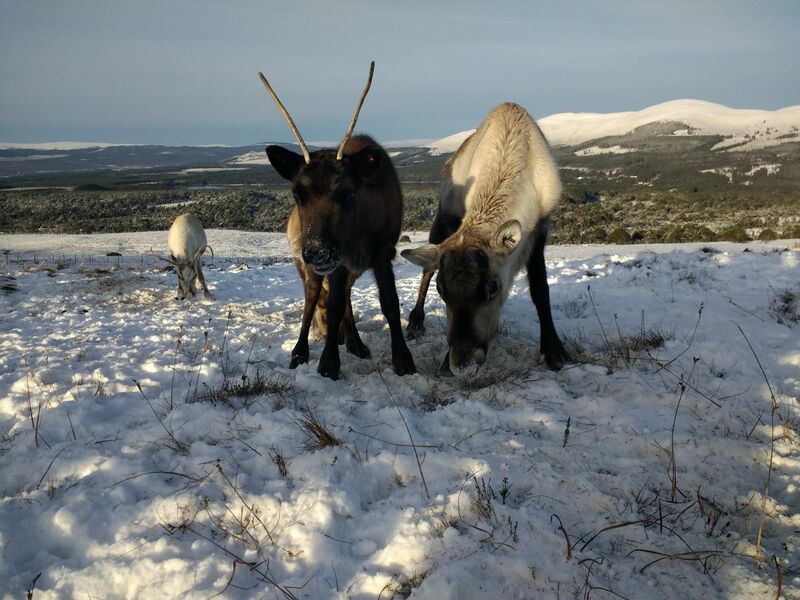 It was a stunningly beautiful day and the reindeer behaved impeccably, although it had taken Alex some time to bring them down off the mountains, where they had been free ranging, to the enclosure on the hill. 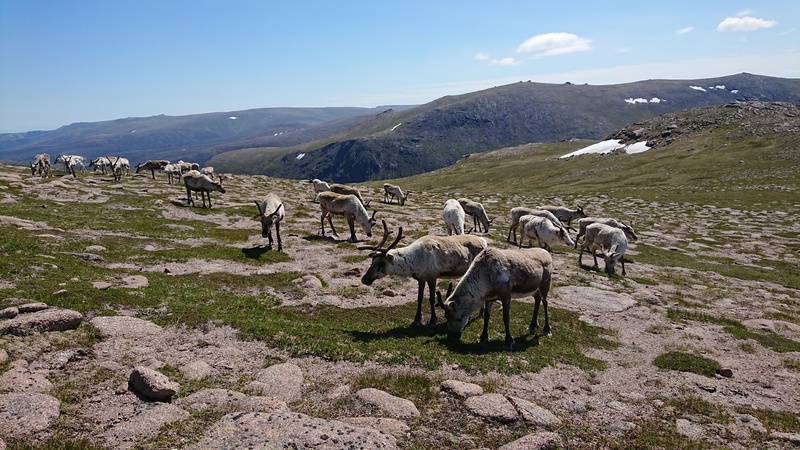 I have, as I said, visited a number of times before but have never seen so many people on a hill trip, it is all good for the centre as they obviously need to make money to look after the reindeer and this is such a lovely way to generate income. 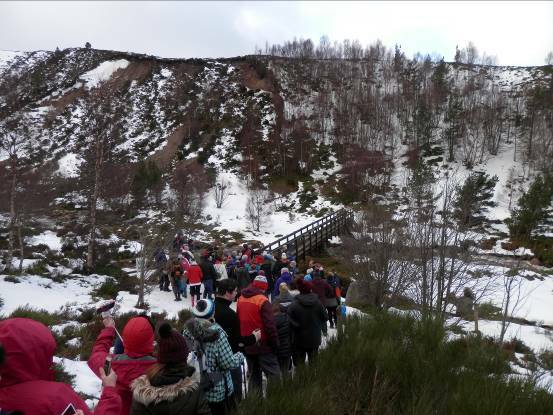 The queue to Utsi’s Bridge! When we got back off the hill there was time for a quick bite to eat at the café next door (well worth a visit) and then back to the hard work. 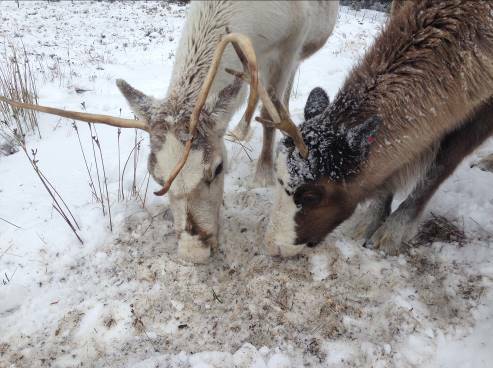 My next job was to mix the reindeer feed. Oats, hay, beets, molasses and sheep feed….mmmm lovely. 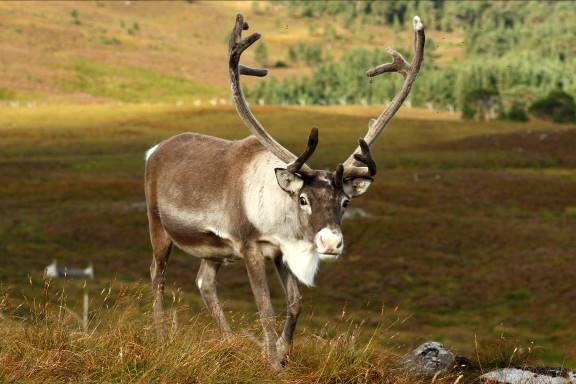 I do have to mention here that the hay is coated with garlic, apparently this helps protect the reindeer from biting insects in summer and is generally good for them. It is also very good at making your hands and clothes very smelly, I suspect I will not have to worry about vampires for some time to come! I joined the other team members in the office after that. I really would love to have the view out of my office window that they are lucky enough to have there…wow! My suggestion of some form of office Winter Olympics fell on deaf ears, I’m sure chair ice hockey would have been a sure fire hit….think they were too busy though. It did open my eyes as to how much work goes into running the business. Andi has just re-done the website, and a great job she has made of it. Chris was arranging all the Adoption requests that were coming in online and Olly was hammering lots of nails into the wall…think he just likes making a noise! 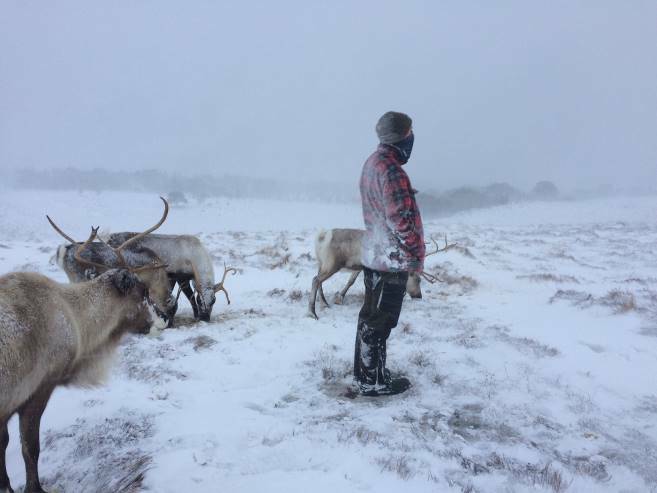 All the day to day stuff does take a lot of time and then there are the reindeer to be looked after too, a herders work is never done. On my drive back to my accommodation at the end of the day, I joined the steady stream of traffic coming off the mountain from a day skiing. As we were approaching Loch Morlich, everyone was braking and pulling into the side of the road, being the nosey person I am, I followed. 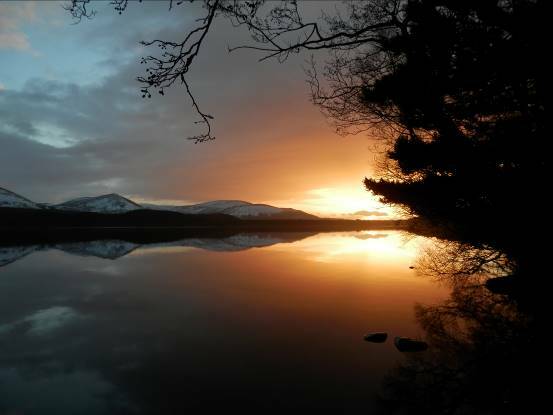 I was rewarded with the most amazing sunset over the mountains and loch, absolutely incredible. Day 2 of my visit was a bit chaotic in the morning. Chris and Olly had gone to bring the herd down from the mountain for the visitors to see in the enclosure, which left poor Dave alone with me at the centre. While he was dealing with everyone in the shop wanting to book on the tour, I opened up the enclosure, following my idiots guide to the letter…no one complained, so I think I did it right. 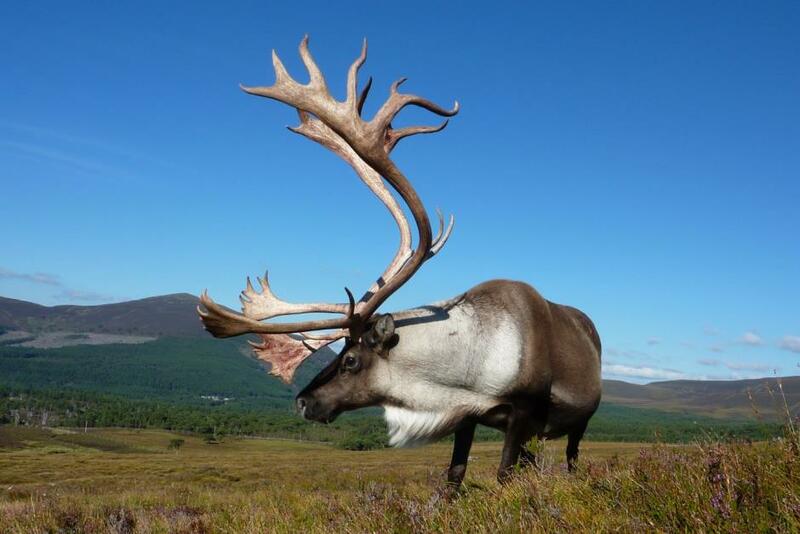 Reindeer were in the right place at the right time anyway! 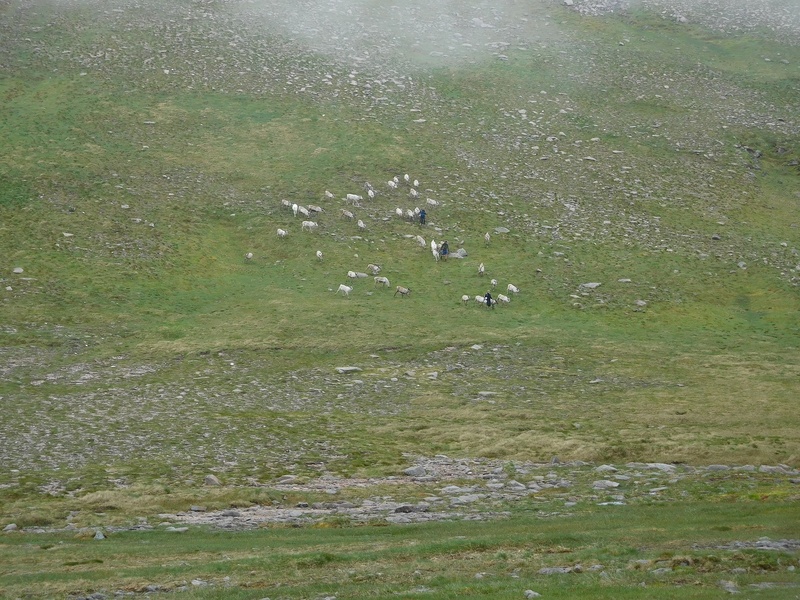 The herd on the mountains, however, were not so obliging this morning and really took a lot of persuasion to move, the hill visit had to be delayed until 12, but no one seemed to mind and it was all worth it in the end. I did the hill tour with Dave and Chris. 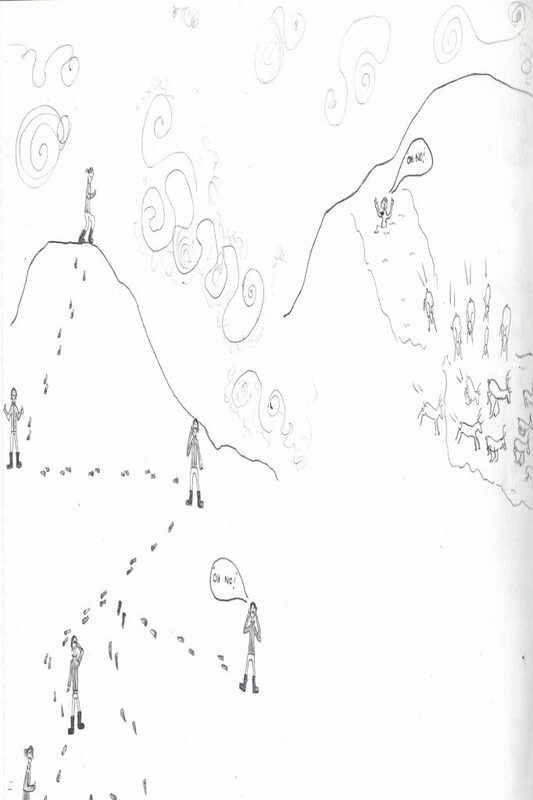 It is interesting to look on and see how the different herders give such great tours, but in a different way to each other, they say the same thing but put their own take on it. Dave had to cope with one or 2 interesting questions from a few of the children on the visit and was very patient when one youngster kept putting him right on his pronunciation of ‘lichen’, he is a New Zealander so deserves a bit of stick (Fiona originally wrote ‘slack’ but we think he deserves some stick for it!). When it was time to come down off the hill, we were obviously last out of the paddock, but as there was a bit of a queue in front of us, and we were all hungry, alternative methods of getting down the snowy valley sides were explored. Dave and Chris just ran down the side to the bottom near the river, I’m not sure they actually expected me, a middle aged Yorkshire woman to follow them….but of course I did. What I hadn’t taken into consideration was that their legs are considerably longer and younger than mine, so although I managed to run about 5 steps straight down, I ended up on my backside for the rest of it…my own version of the luge afterall! It was great fun until I was aware the river was fast approaching but thankfully managed to stop in time! The girls weren’t impressed at being made to wait for brunch whilst Chris and Dave chatted to the visitors! The rest of the day was less of an adrenalin rush thankfully! I was in the office having a fuss with the dogs and generally chilling out until it was time to leave. I had such a wonderful time in my 2 days there, I will always be grateful to the herders, firstly for letting me spend time there but also for their patience, time and guidance. They are a great group of people and do an amazing job, giving us all the opportunity to see these beautiful animals in their natural environment. Thanks guys! I’ve been well aware over the last couple of weeks that it’s definitely my turn to write a blog, and my justifications of going away on holiday, then having to catch up on work, and reorder stock for the shop, and organise the new adopt gifts, and… have started sounding a little too like excuses. 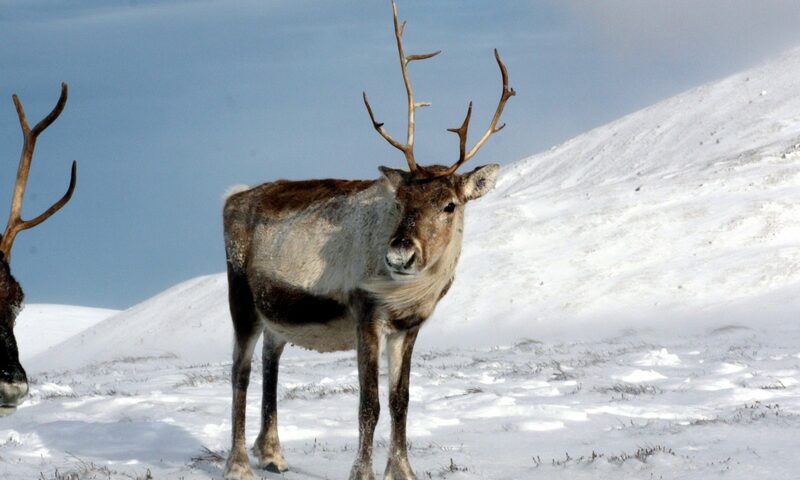 Hen started a lovely series about memorable reindeer, and I thought I’d jump on the bandwagon. In my first calving season, 2012, Esme was one of the pregnant females who was in the enclosure so we could keep an eye on her when she calved. 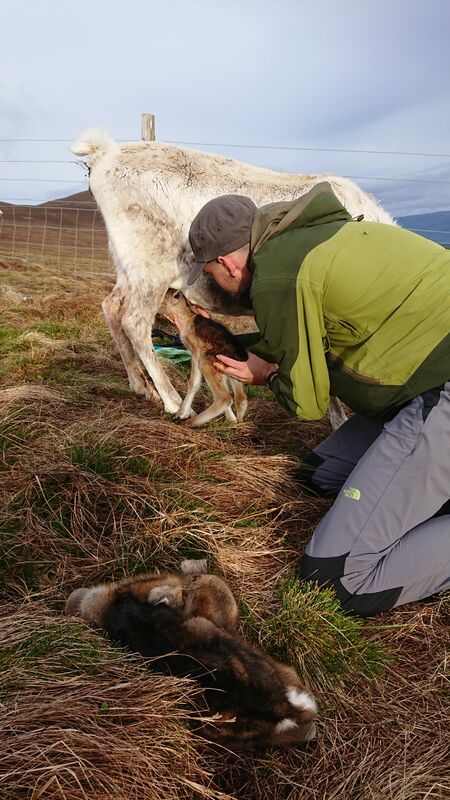 Being a novice to the world of reindeer midwifery, I would walk out with a more experienced herder and learn the correct way to approach a new mum, how to check over the calf, and how to bring them back in to the herd. As we neared the end of May, only one female was left to calve – Esme. 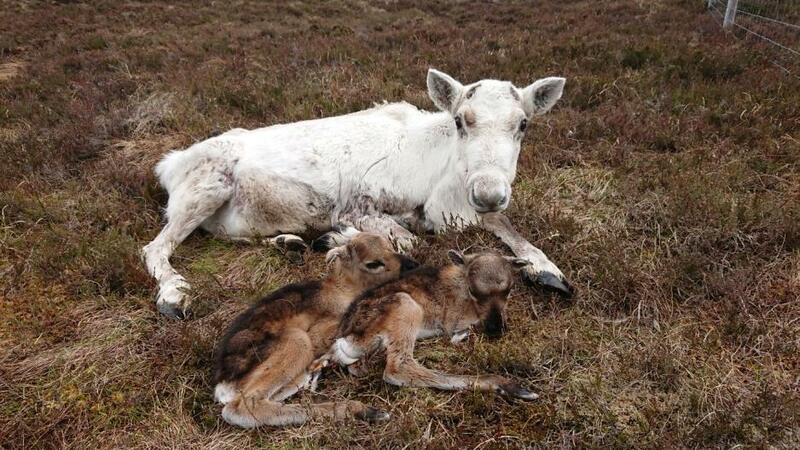 She was the sweetest of reindeer – calm, docile, and an experienced mum. She was also beautiful, with a silvery sheen to her coat. 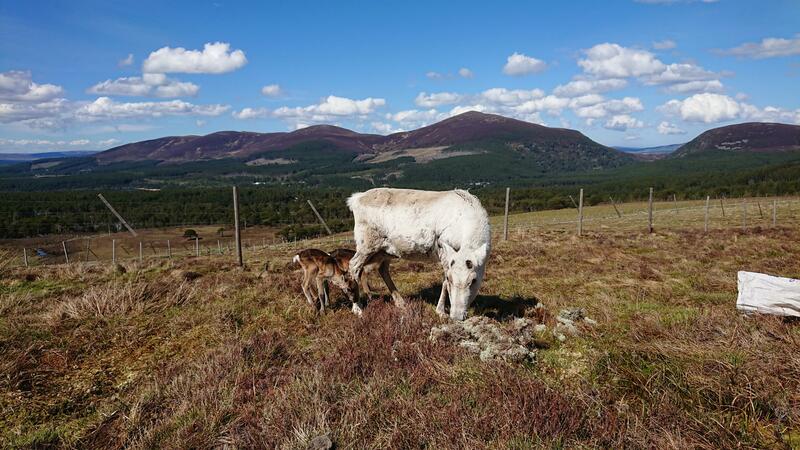 So when the day came that Esme had left the herd to calve, we spied her with binoculars up on Silver Mount, and Fiona asked if I wanted the honour of going to find her and her new calf. I was apprehensive – What if I didn’t get it right? Or if she wouldn’t let me approach? – but still jumped at the chance. Hiking up from Black Loch onto Silver Mount, the “baby bag” with the essentials on my back, I still remember feeling the nervous anticipation. I needn’t have worried – as I came over the ridge and saw Esme, she looked up calmly and took a couple of steps towards me (well, the bag of food). 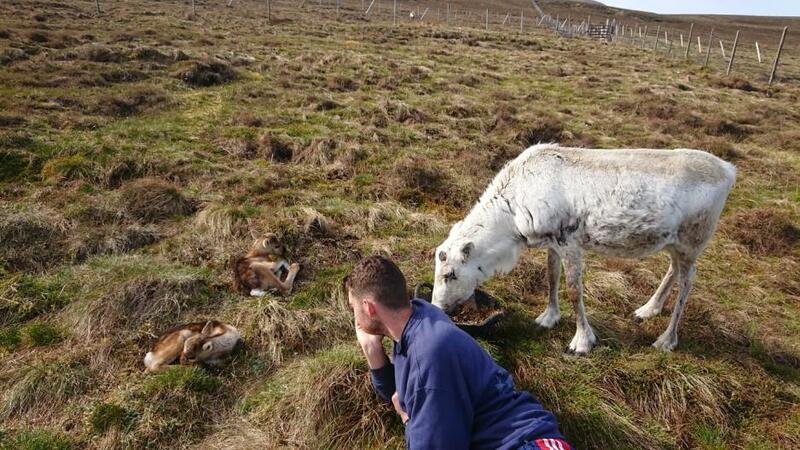 I scanned around – had she calved yet? – before spotting the tiny bundle of new life at her feet. I can’t claim to have done everything in a smooth polished fashion, but Esme was the most patient lass ever, standing whilst I fumbled with the headcollar, not quite having the right technique for holding her calf whilst I sprayed his navel, and talking myself through what to do (out loud!). Finally, we were ready, and we proceeded down the hill and back to the “nursery” area of the enclosure. She must have been rolling her eyes at my inadequacy, and I’m fairly sure she did actually yawn a couple of times! Over the following years, Esme remained one of my favourite females – she was always a friendly face in the herd, dependable and happy to follow a bag of feed to wherever you wanted her to go, and easy to catch if you needed to put a headcollar on her. As she aged, she struggled a little at times to maintain her condition, and we’d slip her extra bits of feed, allowing her to join in when we fed the calves out of the bag. Throughout, she was never pushy, always waiting to be invited, though once her head was in a feed bag it was almost impossible to remove it! 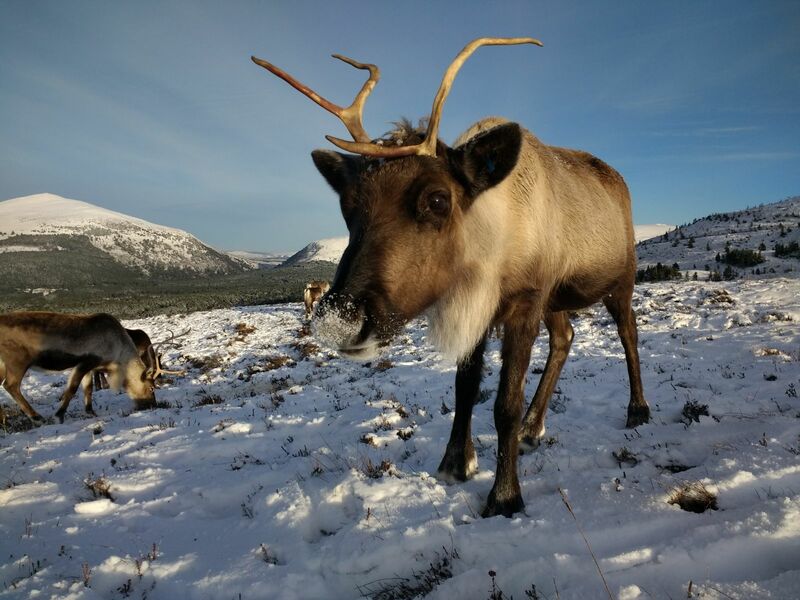 Reindeer, like people, age at different rates, and whilst some of our charges still look in their prime at 13 or 14 years old, by the time Esme was 11 she certainly looked like an old girl. 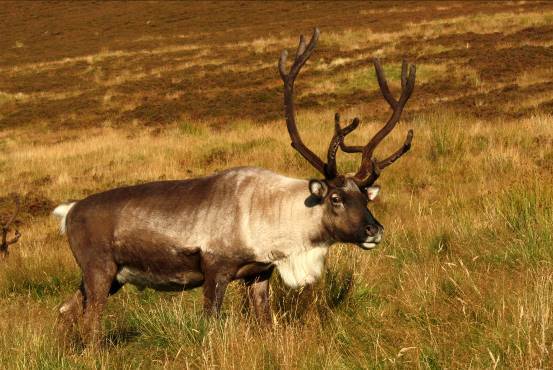 She was also spending more time alone, away from the herd, which isn’t uncommon for the older females – they have the confidence to enjoy their own company, and can sometimes be pushed out by the younger, stronger reindeer. 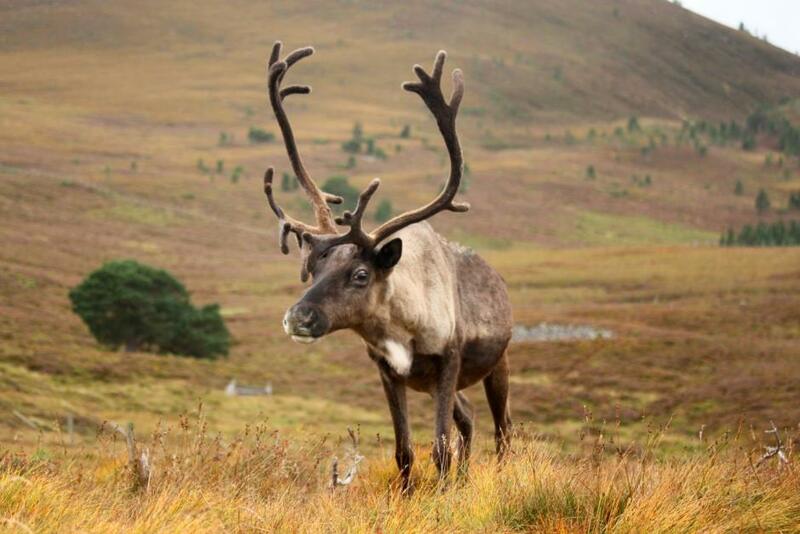 In the 2014/15 winter, Esme was often away from the herd for weeks at a time, off doing her own thing, and there was a memorable day when we spied for the reindeer and saw one lone female marching across the Ciste flats towards the car park. Aware that the rest of the herd were a good distance away in the next glen, we peered through the binoculars trying to work out who it was, finally realising it was Esme! 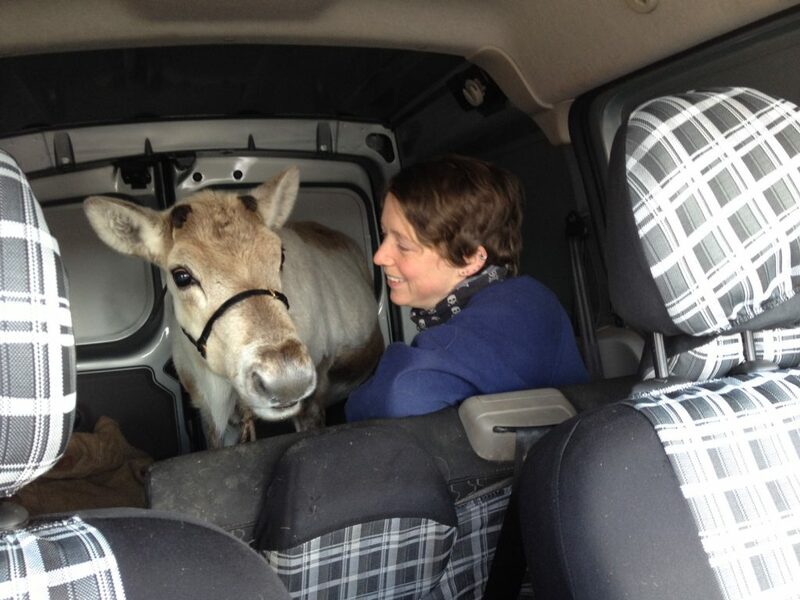 Once we’d popped the back seats down to give her some more room, she gave no objections to following us into the van. She must have thought it was a definite upgrade on the usual trailer, with a much better view, and being allowed to munch her way through a bag of feed enroute was also an added bonus! A short 5-minute drive and it was time to emerge at the other car park nearer the herd. 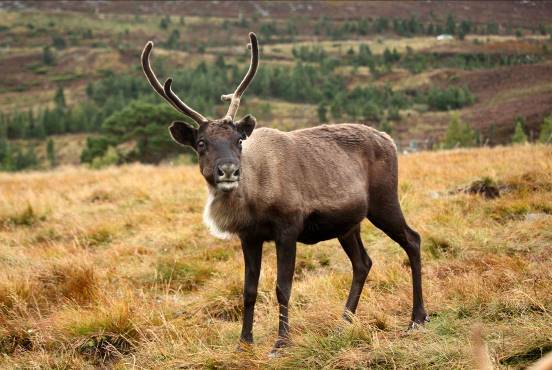 There was a car pulled up with a few people admiring the view, and the last thing they must have expected was for a reindeer to hop out of a van! Esme didn’t bat an eyelid at the whole experience, and was quickly reunited with the herd. 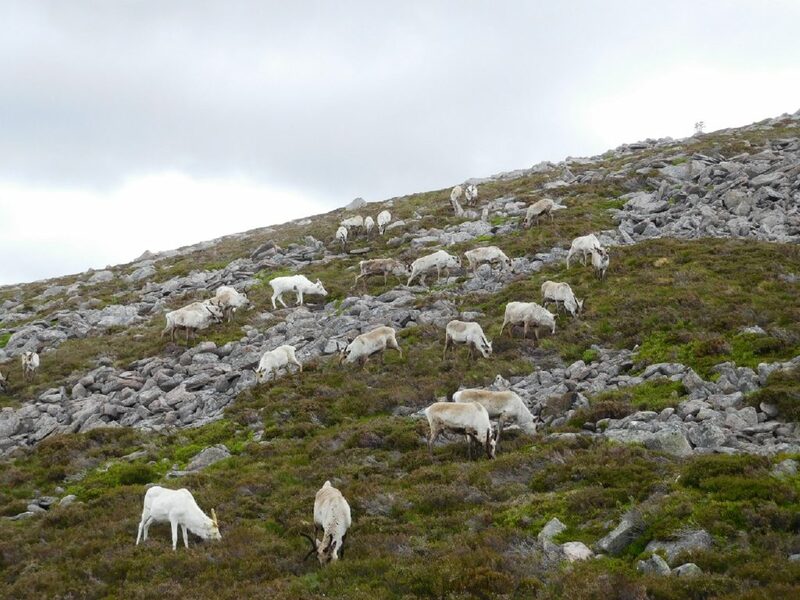 Esme had a good summer that year high on the Cairngorm free range, but when the females started coming down to lower ground in autumn, she was clearly feeling her years. We moved her over to our Glenlivet hill farm, where she could have access to the large straw-filled barn and ad-lib food in the day, with a gentle stroll onto the hill at night, and she settled right in – she was a funny sight – a little old lady amongst all of the big chunky castrates. She also completely won over the hearts of the men at the farm! 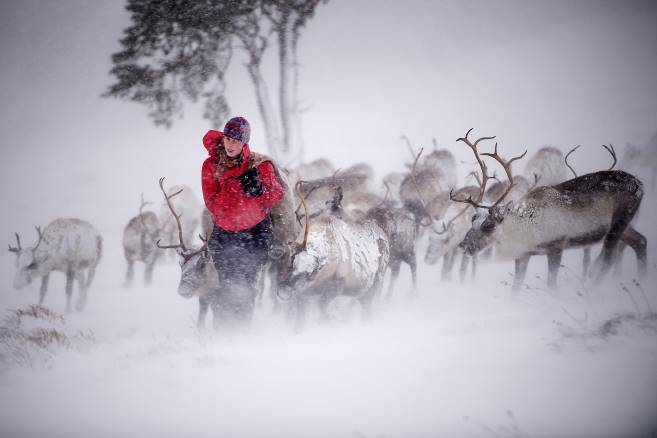 One evening, they went to move out the reindeer onto the open hill for the night, and for the first time, Esme didn’t want to go. With no wish to force her, they let her stay in the shed, and slipped her an extra bucket of lichen. In the morning, she had passed away in her sleep, peacefully tucked up in the straw. 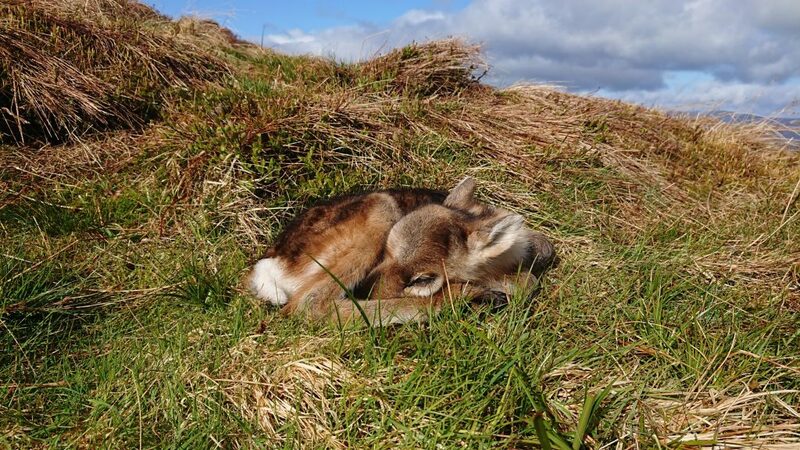 It’s always galling when animals die, but I can’t think of a better end for one of the gentlest reindeer I’ve known. Esme’s family members are still in the herd – her daughter Okapi is a slightly less polite version of her, son Elvis is a dependable but enthusiastic fellow, and sister Sambar is a sweet lass who keeps to herself. All of them share the similar silvery coat colouring, and remind me each time I see them of lovely Esme.